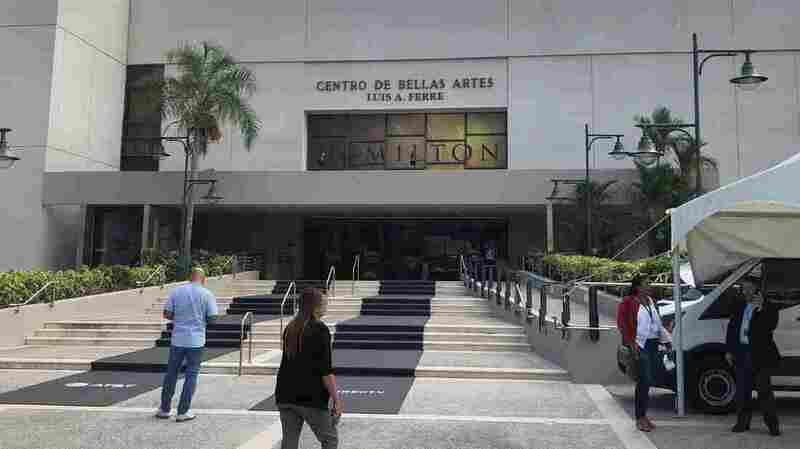 'Hamilton' Arrives In Puerto Rico, Bringing A Bit Of Controversy With It When Lin-Manuel Miranda announced plans to bring Hamilton to the island, it was meant to lift the spirits of the island's residents. But things haven't gone as planned. Puerto Rico's Fine Arts Center. When Miranda announced the production a year ago, he envisioned it as a way to lift people's spirits after the devastation of Hurricane Maria and to raise millions of dollars for arts on the island. But the show's arrival has also brought controversy. This is one of the biggest artistic events on the island in recent memory. There are also a lot big names expected to attend: more than 30 members of Congress, Speaker Nancy Pelosi, Former President Bill Clinton and Oprah Winfrey among them. For his part, Miranda announced that the Tony Award-winning production would come to the island soon after the hurricane and that the money raised from the show would go to arts organizations on the island. Lin-Manuel Miranda and his father Luis, who's running the production, invested about $1 million to renovate the theater at the University of Puerto Rico so it could stage the show. But a couple of weeks ago, amid the threat of protest, the Mirandas abruptly announced they were going to move the production to the Fine Arts Center in San Juan. Puerto Rico is in default on more than $70 billion in debt. In 2016, the U.S. Congress created an oversight board to essentially take control of the island's finances and renegotiate the debt. This law was called Puerto Rico Oversight, Management, and Economic Stability Act or PROMESA, and back when Congress was debating it, Lin-Manuel said he supported it, and so did his father Luis. Luis Miranda now says he opposes what this board is doing. "I supported PROMESA," Luis said from the theater in San Juan. "It was the only way that we saw at that point, Lin-Manuel and the family and quite frankly many others, to make sure that Puerto Rico can restructure the debt. the unintended consequences of that junta that has become a sort of psuedo-government is something that clearly everyone should be against." Puerto Ricans see PROMESA as a kind of colonialism. And the irony that Hamilton is a musical about a response to colonialism has not been lost on people. As for the move from the university to the fine arts center? That gets back to the economics too. Some of the steepest cuts imposed by this oversight board have fallen on the University of Puerto Rico. And recently a union of University employees threatened to strike over the cuts. The Mirandas decided they didn't want to risk the possibility of their production being disrupted. With all the rebuilding that still needs to be done on the island, Luis Miranda thinks the visit from elected officials for the show might help that recovery along. "What I hope will happen is that they will see first hand what happened to Puerto Rico after Maria. The progress that has been made, and everything that still needs to happen to build an island that is more resilient and greener than before Maria," Luis says. As in the U.S., tickets have sold out for the show. That was also a point of some tension, because it made the show inaccessible to a lot of people on the island. But the Mirandas are also doing a lottery for 10,000 tickets at $10 a piece.